This is one of the greatest books I've ever read. I got it a couple of years ago, and it did what it says on the cover; it unlocked the poet within me. It taught me about prosody - the art and craft of versification. The thing I've always most enjoyed is the craft, the nut-and-bolts, of poetry writing. It's great to come up with stories and ideas, but the deepest pleasure for me comes from fitting those ideas into a form, with the rules and limitations that come with it. And often, the greater the limitations, the more fun it is. It's all about pushing against the boundaries of the form, without breaking them. Some of the forms I learned about in the book are very limiting. The Sestina for instance. I won't try to explain it here. It's complicated. As it says in the book, the best way to understand it is to write one, but if you're interested, check it out: http://en.wikipedia.org/wiki/Sestina (next week's post will be a Sestina). 'Old Moon', the first poem in this blog, is a Rondeau Redouble. 'Galdr Song' is composed of five sonnets. This marvellous book taught me how to write them. to investigate the technology of poetry, to be a craftsman. 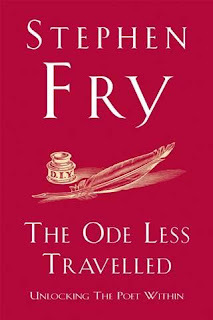 Of course, another wonderful thing about The Ode Less Travelled, is that it's written by Stephen Fry. One couldn't wish for a more genial teacher. His mellifluous tones spill from every page. It goes with me everywhere. I highly recommend it. 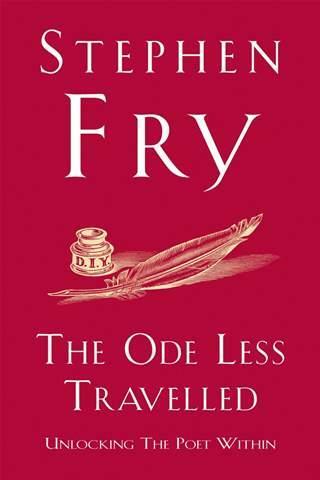 Hooray for Stephen Fry!